Determine the Mastermind's color combination. Try to solve the color combination with the least ammount of moves as possible. Click a Peg to select it. Click a Color to assign it to the selected Peg. Click Check when all four Pegs are colored to receive Clues from the Mastermind about your combination. Every white Clue means one of your colors is correct, but it is in the wrong Peg. Every black Clue means one of your colors is correct, and is in the correct Peg. Clues only tell you how many colors are correct, NOT which ones! That is for you to deduce on your own. 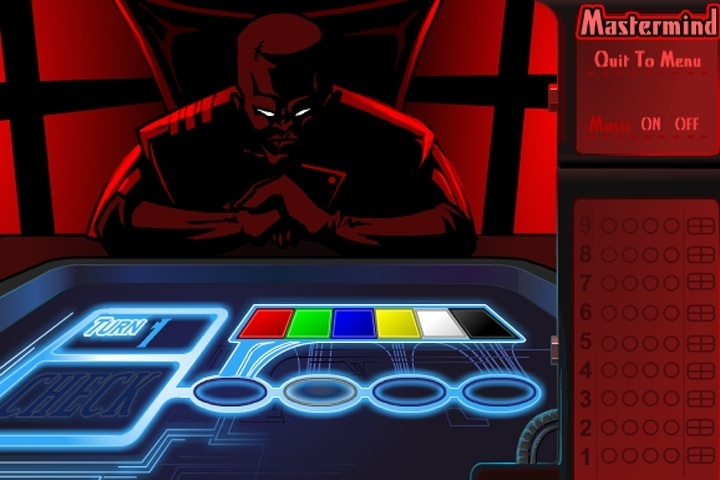 If you want to play Mastermind The Puzzle games online you have come to the right place! GamesLoon adds new Mastermind The Puzzle games every week. This is your game portal where you can find the biggest collection of free Mastermind The Puzzle games online. Do not forget to rate our Mastermind The Puzzle free online games while playing!